Jody Maronis turkey-chicken chorizo (or vegetarian chorizo), diced green onions, tomatoes, cilantro, and corn tortilla strips scrambled with eggs and topped with melted cheddar cheese - served with salsa fresca, pea guacamole, sour cream and choice of warm corn or flour tortillas. This is the dish Sharon Stone craves for. 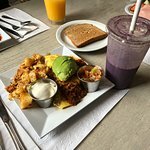 Eggs scrambled with chorizo, mozzarella and cheddar cheese, green onions and mushrooms served with salsa fresca, pea guacamole and sour cream on the side. Rumored to be Paris Hilton's favorite breakfast who was spotted with her sister recently eating incognito with large Gucci sunglasses. Warm corn tortillas topped with three over-medium eggs, spicy ranchero sauce, cheddar and mozzarella cheese - served with pinto beans or Jinky potatoes. This is like the dishes you see in those Antonio Banderas movies, only better. Egg white frittata filled with zucchini, garlic and fresh basil topped with mozzarella cheese on grilled sourdough - served with Jinky potatoes **With chopped bacon, sausage or ham - Add 1.50. Josh Groban might just sing his heart out for this Los Angeles breakfast favorite. 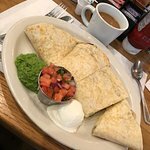 (A grande breakfast burrito) A hardy blend of scrambled eggs, red onions, diced tomatoes and ortega chilies, cheddar cheese, chopped potatoes and Jody Maronis turkey-chicken chorizo (or vegetarian chorizo) served with pea guacamole, salsa fresca and sour cream. Enjoy! (substitute chorizo with choice of Gourmet Chili) - Add $1.50. Desperado tops the Los Angeles breakfast menu especially for big guys with big hearts like Vin Diesel. 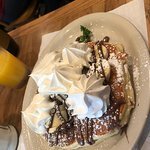 A mathematical breakfast special 2 eggs any style + 2 slices of bacon + 2 buttermilk pancakes (or French toast) - With each additional fruit, flavored pancakes or flaky French toast…Add 1.00 (substitute egg whites…Add .99). Warm corn tortillas, topped with eggs over easy, grilled chicken breast, tomato sauce, avocado and mozzarella cheese. Served with pinto beans. A breakfast menu with a Mexican twist, believed to be on J.Lo's A-list. Jinky’s pancakes are made with fresh ingredients every day. We like to think that we are the standard by which pancakes are judged. Many Yelp and CitySearch reviews can be seen confirming this. A breakfast combining two of the most loved fruits. Los Angeles breakfast has never been this colorful and delicious, Selena Gomez you better try! Jinky’s pancakes are made with fresh ingredients every day. We like to think that we are the standard by which pancakes are judged. Many Yelp and CitySearch reviews can be seen confirming this. Zac Efron is a heartthrob and all but his sweet-tooth sure makes him vulnerable to this Los Angeles breakfast delight. Mandarin orange, coconut, and macadamia nuts. Katie Perry's dream breakfast in Los Angeles featuring macadamia and lots of other good stuff. It's a breakfast for every bubbly soul in LA. Fluffy buttermilk pancakes topped with vanilla ice cream, caramel sauce, almonds and whipped cream. This irresistible breakfast will make you want for more breakfast in Los Angeles. Sweet, creamy and fluffy, this was once Natalie Portman's comfort food. Jinky’s pancakes are made with fresh ingredients every day. We like to think that we are the standard by which pancakes are judged. Many Yelp and Citysearch reviews can be seen confirming this. It's a treat Khloe Kardashian grew up with. Little sweet cakes is everything you need to brighten up your breakfast experience. It's happiness on a plate. No wonder Los Angeles breakfast is incomplete without it! Choose a breakfast that features the fresh picked goodness of a lemon. Served with whipped cream, raspberries and lots of other good stuff, it's an unforgettable Los Angeles breakfast. Topped with mascarpone frosting and dusted with powdered sugar. Favored by late night breakfast creatures with unusual dentistry. Folk say they are addictive like having a wooshy feeling on demand. And that once bitten ... you cannot stop. These pancakes are a favorite of the amazing pop star Pink - a softer red. Topped with raspberry sauce, blackberries, raspberries, blueberries, strawberries and whip cream. It's a fun morning dining in a Los Angeles restaurant like Jinky's. A breakfast menu made of freshness and healthiness, yum! Ashley Tisdale would want some of these! Mixed greens with sliced red onions, cucumbers and cherry tomatoes topped with tandoori chicken. Zac Efron enjoys this healthy salad that it often makes him break out in a song. With large Thomas english muffins, veggie sausage, scrambled eggs, ranchero sauce and cheddar cheese. The taste of the south is well celebrated in this breakfast menu. Beyonce Knowles would surely love to wake up to this flavor. Grilled chicken breast, poached eggs, topped with ranchero sauce, avocado and cheddar cheese. An exciting addition to the varied breakfast menu in LA that gives a new flavor to Eggs Benedict! Selma Hayek, you definitely must try! With large Thomas english muffins, poached eggs, crab cakes and the house hollandaise sauce. The most delicious breakfast in LA; the Crab Cake Benedict it makes the breakfast in Los Angeles more delicious and more convenient for vegetarians. Kristen Bell must love this! 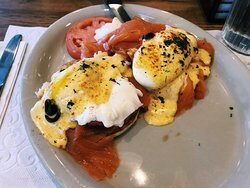 Wiith​ large Thomas english muffins, poached eggs, lox and the house hollandaise sauce. Justin Bieber and Lox Benedict have something in common girls love them! Known as a well-reviewed breakfast among Los Angeles restaurants, there's no question why girls go gaga over this meal. 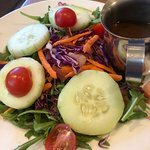 With​ large Thomas english muffins, poached eggs, cornedbeef hash and house hollandise. 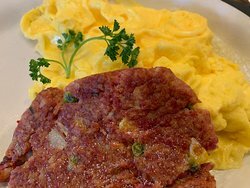 This Los Angeles breakfast gives you a new look at what omelettes are about; corned beef hash plus chillies topped with ranchero sauce. This is the breakfast that Jane Lynch has been waiting for. Sugar, spice and everything nice is not limited to Demi Lovato. It can be found in a Los Angeles cafe too and dubbed one of the best breakfasts in LA. French toast sweet and all natural style! Naomi Watts' charm is nothing compared to this Los Angeles breakfast menu. It's a breakfast treat loved both by the young and the old. Topped with pumpkin marmalade, whipped cream and dusted with powdered sugar. A healthy yet sweet twist to a Los Angeles breakfast. 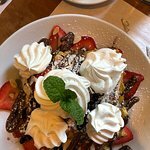 Flaky French Toast topped with strawberries, banana, chocolate chips and dusted with powdered sugar. It's like the Megan Fox of all toasts! It's the ultimate treat! 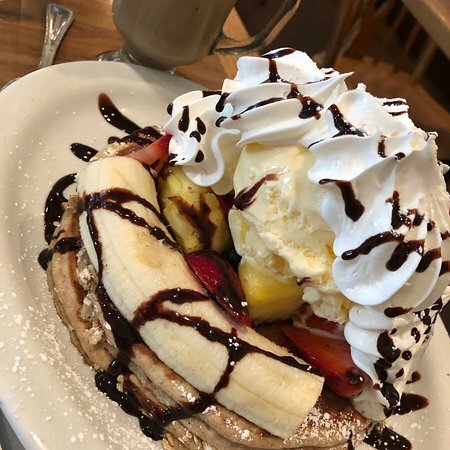 Overflowing with bananas, strawberries and chocolate chips, this breakfast in Los Angeles will jump-start your day with sugar rush. Freshly made and dusted with powdered sugar. A timeless Los Angeles breakfast menu item! Just like the timeless beauty of the late Elizabeth Taylor. Mandarin oranges, coconut, ice cream waffle and macadamia nuts. oranges, coconuts and ice cream make a breakfast in LA unforgettable. Scarlett Johansson would love to try one of these! Vanilla ice cream, whipped cream, almonds, and caramel or chocolate syrup. Miranda Cosgrowve's favorite breakfast in LA! It's loaded with all the good stuff that will tickle the kid in you, another LA breakfast favorite. Belgium waffle topped with pumpkin marmalade, vanilla ice cream, walnuts and whipped cream, dusted with powdered sugar. Mara Wilson's breakfast in LA is a sweet and creamy combination of ice cream, whip cream and pumpkin marmalade. Our very own Belgium waffle topped with strawberries, banana's, blueberries with a raspberry sauce and whipped cream. Topped with strawberries, bananas, blueberries and raspberry sauce, it makes a perfect breakfast menu treat! Leighton Meester, try this! Topped with whipped cream. This LA breakfast is a simple yet creamy and unbelievably delicious breakfast menu item, no doubt it's Katie Holmes' comfort food. 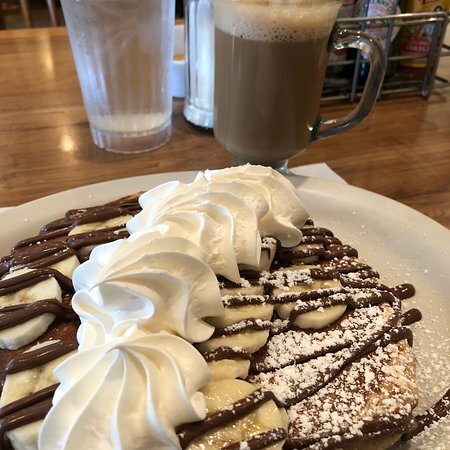 Crepes filled with sliced bananas and delicious hazelnut spread topped with whipped cream and dusted with powdered sugar. The irresistible yumminess of nutella paired with the healthy goodness of banana has left Kelly Preston asking for more. Macadamia nuts, strawberries, chocolate chips and whipped cream. Definitely not your ordinary berry. It features the rich flavors of macadamia nuts plus strawberries and chocolate chips. It's a Keira Knightley LA breakfast too, and don't ask why! Topped with Pumpkin marmalade, Baked cinnamon apples, whipped cream, almonds and dusted with powdered sugar. The country goodness of pumpkin and baked apple, listed as one of Gwyneth Palthrow's favorite LA breakfasts of all time. Topped with strawberries, banana, blueberries and raspberry sauce with whipped cream. A combination of all time favorite fruits rolled together to make the perfect crepe. Jenna Fischer is sure to enjoy this Los Angeles breakfast for its flavor and taste. Topped with whipped cream and dusted with powdered sugar. This is the real deal! Even Bradley Cooper will grab a bite for himself. Topped with whipped cream, mixed berries and dusted with powdered sugar. Jody Maroni’s turkey chicken chorizo, chopped jalapeno and mozzarella cheese topped with tomato sauce. The kind of stuff Jaden Smith would like on his plate. Fresh spinach, feta cheese, tomatoes and red onions. A combination of feta cheese, spinach and tomatoes. Kim Kardashian would surely want to take a bite of this one. A magnificent omelette with a choice of Gourmet Chili, cheddar cheese and red onions, for the truly hungry and spicy. It comes with onions, cheese and gourmet chili, a must try LA breakfast and it's Ryan Reynolds's favorite too! Vanessa Hudgens is a unique and talented individual who chooses to pick her favorites such as egg whites, turkey, avocado, scramble them together. Fluffy egg whites filled with boursin cheese, zucchini and tomatoes. Egg whites, zucchini and Boursin cheese is what this Los Angeles breakfast is about. Eva Green will surely feel at home with every bite. Filled with choice of gourmet chili, chopped potato, red onions and cheddar cheese, topped with sliced avocado and cilantro -served with a side of salsa fresca and sour cream. This is how hot Penelope Cruz wants her LA breakfast to be. Lots and lots of gourmet chili, potatoes, cheese, avocado and lots more. Fresh spinach, mushrooms garlic and Boursin cheese. As can been seen from the reviews this is a VERY popular dish unless you hate Garlic.. “If you're watching your diet, be sure to request egg whites only, and fruit instead of potatoes" If this is what all Los Angeles restaurants are made of, then even Sarah Jessica Parker would head to LA everyday. 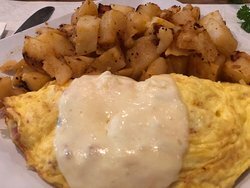 History of the Dish:This dish was originally created by Alan Kar during a “cheese obsessive period” ( 1998-2000) during which time over 120 cheeses were “omlette tested “ this very popular dish was one result. Egg whites, grilled chicken breast, parsley, dill, basil and boursin cheese. Chicken and the vivid flavors of nature on top of egg whites. A healthy and lean breakfast treat that even Miley Cyrus will classify as an LA breakfast must try. Aidells habanero-green chili sausage, jalapenos, mushrooms, and ortega chilies topped with our spicy secret recipe ranchero sauce. Your LA breakfast can only be hotter if you're dining with Johnny Depp. Otherwise, this is the hottest breakfast for you. (Turkey bacon available) We even have pure egg whites to help you score abs like that of Matthew Morrison. Aside from a juicy ham steak, which Jessica Alba is so fond of, this breakfast allows you to choose your eggs, toast and sides. Breakfast in Los Angeles has never been this personal, huh! This breakfast is dubbed Naya Rivera's favorite. You can choose your toast, eggs, sides and sausages. It's your breakfast, so it's your call. Beef, turkey, veggie, turkey chicken chorizo or veggie chorizo. 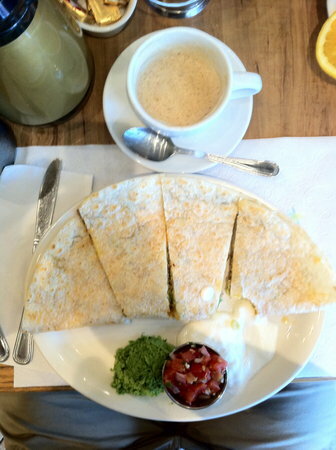 A recent Los Angeles breakfast favorite of Dianna Agron. She loves this choice because she has to reinvent her breakfast everyday. It's like having the same breakfast menu in a lot of fun ways! This breakfast features lean yet juicy chicken breast, egg whites and toast of your choice. It's certainly a Los Angeles breakfast must try. Jayma Mays enjoys this savory dish for brunch...its healthy and filling. It's​ a Los Angeles breakfast that will fit George Clooney's appetite. A big, fresh, fat and juicy steak to start the day right. Plus, this breakfast also comes with toast, eggs and sides of your choice! Egg whites, chicken breast, salsa fresca and mushrooms. This breakfast item comes with the goodness of egg whites, salsa fresca and mushrooms. It's then paired with chicken breast. It's Kristen Stewart's top choice too! Red onions, tomatoes, bell peppers, cilantro, jalapenos, crushed pepper, Indian spices and tortilla chips. 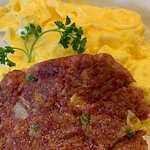 Prepare for a really hot breakfast in Los Angeles (think hotter than Megan Fox) and spice up your breakfast with Alan's favorite. Veggie​ patty or (vegetarian chorizo) chopped and scrambled with red and yellow bell peppers, onions, mushrooms and mozzarella cheese. Breakfast in Los Angeles is now vegan-friendly. This dish has some of everything but Reese Witherspoon can't resist topping this off with our yummy pancakes as well. This is truly a million dollar breakfast!! Tofu, bell peppers, red onions, spinach and broccoli. It includes tofu, broccoli, red onions and spinach. It even gives you the option to choose your sides and eggs. And this is why Owen Wilson loves it. Spinach, garlic and tomatoes. Wanna be stong and fit like Popeye or Robert Downey Jr.? 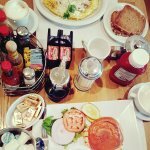 Munch on this Los Angeles breakfast and it will surely give you the energy you need for the day. Turkey, green chilies, tomatoes and cheddar. Nicolas Cage would love this breakfast on his table every morning. Juicy turkey, green chillies, tomatoes and cheddar; certified pure Los Angeles breakfast goodness! Fresh basil, garlic, tomatoes. Monica Belucci will feel at home with this simple, Italian – inspired breakfast treat. Tofu,​ wild rice, black beans, zucchini, mushrooms, red and yellow bell peppers, onions, and garlic-chili sauce. If you're like Alicia Silverstone, choose this breakfast and you'll have a guilt free Los Angeles breakfast. Bacon, mushrooms and onions. This is how Taylor Lautner wants his breakfast to be, simple and classic! Tomatoes,​ onions, cilantro and jalapeno. Cream cheese, red onions, capers, and tomatoes with a choice of beige. Reward yourself with this breakfast menu treat. It's richness, smoothness and yumminess is sure to make you go back for more. It's Teri Hatcher's favorite too! Rolled oats, whole wheat, barley and rye made to order - served with sliced banana, raisins, and brown sugar. Start making your breakfast in Los Angeles healthy and see the benefits in no time. Choose to live healthy and look good; ask Demi Moore, she should know! Mixed fruit, low fat granola and low fat yogurt. The healthiest Los Angeles breakfast menu we can think of. Start your day right with the healthy stuff and you'll feel great the whole day, this is probably what Blake Lively's breakfast is like. With sliced banana, raisins, and brown sugar. Make your Los Angeles breakfast light and healthy. This breakfast is the type responsible for Scarlet Johansson's midriff. Your tummy will thank you for this! Rolled oats, whole wheat, barley and rye - made to order - served with sliced banana, raisins, and brown sugar.